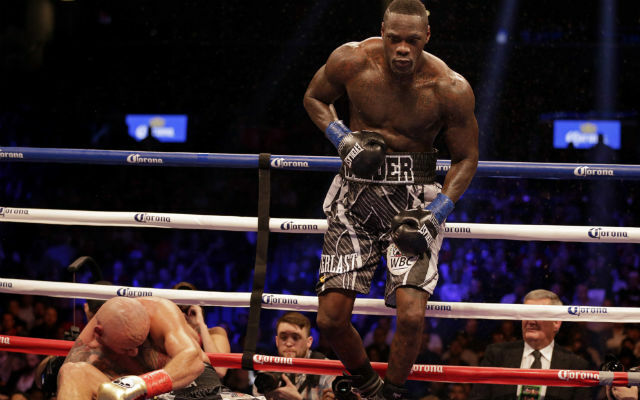 WBC heavyweight champion Deontay Wilder 40-0 (39) and British promoter Eddie Hearn have finally reached a consensus. Unfortunately it’s not about a future fight between the unbeaten American knockout artist and his British counterpart IBF, WBA and WBO champion Anthony Joshua 22-0 (21). “There are a lot of things I don’t agree with Eddie about – I can’t stand that guy – but one thing I will agree with him on is that [Tyson] Fury is a boring guy,” said Wilder in the Daily Star, who will defend his green belt against lineal heavyweight champion Fury at Los Angeles’ Staples Center on Saturday night. “You never seen in him in any exciting fights. The most exciting fight I’ve seen him in was when Steve Cunningham laid him down on his back [in a fight in 2013 that Fury recovered to win]. “Other than that, he’s a boring bloke. But he won’t have to worry about it for long. “Come Saturday night, as long as he shows up, and give the fans what he want – that is all that is going to matter because I will do the rest. Wilder and Fury have been up close and personal this week at the final press conference in Los Angeles to promote the fight. And the Bronze Bomber says he has noticed something about the self-proclaimed ‘Gypsy King’. “He’s nervous,” insisted Wilder. “He should be. I got a 90 per cent KO ratio, he has never faced a fighter of my calibre, of my style, my speed or my power, he should be nervous. “He’s supposed to be a little frightened, that’s OK. This is a gladiator sport. You must have confidence, you must have the will to win. It’s going to be a great fight. “People label me as the one with the knockout power. The 33-year-old from Tuscaloosa in Alabama says the pressure doesn’t impact him at all.